The food industry is one of the largest across the globe. Let’s face it. We all need to eat. Skills can be utilised for many different aspects of the food world, with jobs in marketing, teaching, safety, quality management, nutrition, sales, teaching and many, many more. If your taste buds tend more towards international foods, the opportunities in the global industry are endless. Food and Nutrition students will not only learn specific technical skills that they can apply directly to their work, but also a multitude of transferrable skills, from problem-solving to numerical skills, data analytical skills to IT knowledge. to educate students about the requirements of a ‘balanced diet’ in the context of what it means to be human and healthy. This GCSE in Food Preparation and Nutrition is an exciting and creative course which focuses on practical cooking skills to ensure students develop a thorough understanding of nutrition, food provenance and the working characteristics of food materials. At its heart, this qualification focuses on nurturing students’ practical cookery skills to give them a strong understanding of nutrition. 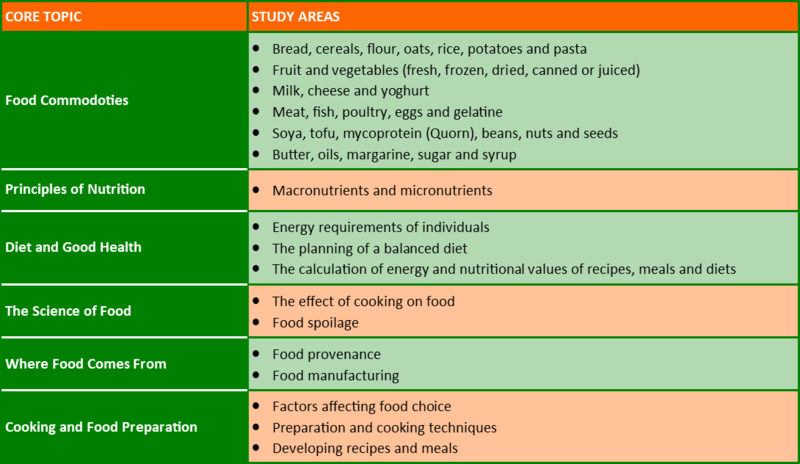 Food preparation skills are integrated into six core topics with associated study areas as detailed in the table below. A copy of the WJEC Food & Nutrition Specification can be downloaded below.